Blueberry bushes grow well in Illinois because they have few problems with insects and disease and have small growing space requirements. Blueberries have a shallow root system and require an acidic soil, which increases the amount of soil preparation and maintenance required for the plant. The berries taste best when picked after they are fully ripe. Blueberry bush foliage adds fall beauty to a garden, with the leaves changing from dark green to crimson red. 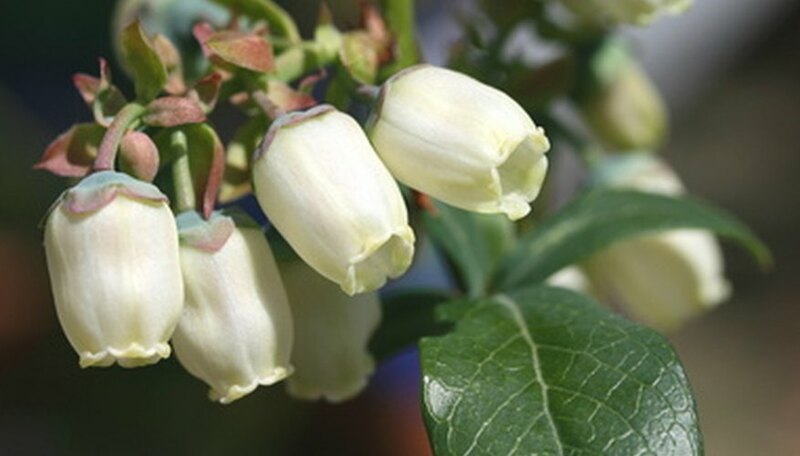 Select a growing area for the blueberry bush that has an acidic and well-draining soil. The plant requires at least six hours of direct sunlight, preferably morning sunlight instead of the hot afternoon sun. Test the soil pH the fall season prior to planting. The blueberry grows best in a soil pH of 4.8 to 5.2. Work ground rock sulfur into the planting area to lower the soil pH. Apply a generous amount of water to the soil to assist with absorption. Work 3 to 4 inches of organic compost into the soil the fall season prior to planting with a tiller to a depth of 10 inches. Plant the blueberry bush the following spring by digging a hole that is twice as wide as and slightly deeper than the root ball. Add a layer of acidic peat moss to the bottom of the hole. Set the root ball in the hole so the top is even with ground level. Carefully pack soil around the root ball. Water the bush immediately after planting to pack the soil around the root ball and eliminate air pockets. Continue to water the blueberry bush throughout the growing season to provide 1 to 2 inches of water each week. Do not create water pools around the stem because this promotes root rot on the shallow roots. Cut 50 percent of the branch length off the bush at the time of planting to promote new growth. Cut all blossoms off the blueberry bush for the first two years to increase plant growth and fruit production starting the third year. Add a 3 to 4 inch layer of bark mulch or rotted sawdust around the bush immediately after planting. This will assist with soil moisture retention and provide acidity to the soil. Fertilize the blueberry bush with ammonium sulfate in the fall season after planting. Do not fertilize at the time of planting as this causes stem and root burn. Provide ammonium sulfate fertilizer to an established plant each spring before the plant produces blossoms. Blueberry varieties recommended for Illinois are Bluejay, Bluecrop, Collins, Elliott, Herbert, Patriot and Nelson. Provide bird netting over blueberry bushes after the blossom and berries form to prevent loss to birds.